Encrypting passwords in a PowerShell script remains a bit of a hot and tricky topic. There are various ways how to parse a password. The golden rule is that you do not want anyone to be able to read passwords in your scripts. This means that you should refrain from using plaintext passwords! 03.07.2018: I discovered a mega stupid error in the script to create a 256-bit AES key and password file. This has now been corrected. My apologies to anyone who had an issue with it. Thanks to my colleague and PowerShell guru Markus Kausl for his assistance! 05.12.2018: Additional comment added concerning the usage of plaintext passwords. The PSCredential object is a combination of the user account and the password. In the last line in the example above, you can see that the PowerShell variables $Account and $AccountPassword are both required to populate the variable $DatabaseCredentials. TRY TO REFRAIN FROM USING PLAINTEXT PASSWORDS IN SCRIPTS. There, I said it. My apologies for "shouting", but plaintext passwords can get you in all sorts of trouble. *As was pointed out to me in one of the comments below, technically speaking using plain text password does have some advantages. However, looking at the overall system as a whole, taking, among other things, security into consideration, plain text passwords should be avoided as much as possible. From a security perspective, they do not hold any advantages. Now let's get on with the good stuff. The remainder of this article will show you a couple of ways how to securely use passwords in a PowerShell script. This is the easiest method of them all, but this method is only suitable for scripts that run interactively. The second line contains the Read-Host cmdlet. When you run this PowerShell script interactively, you are required to enter the password in the PowerShell window. Note: how to run a PowerShell script interactively? The AsSecureString parameter turns your string into a secure string. The PSCredential object only accepts secure strings. You can try it yourself. Simply remove the AsSecureString parameter, execute the script once again, enter your password and see what happens. The PSCredential object will throw an error. Biggest advantages: easy to implement and 100% secure. Biggest drawback: can only be used when running the PowerShell script interactively. 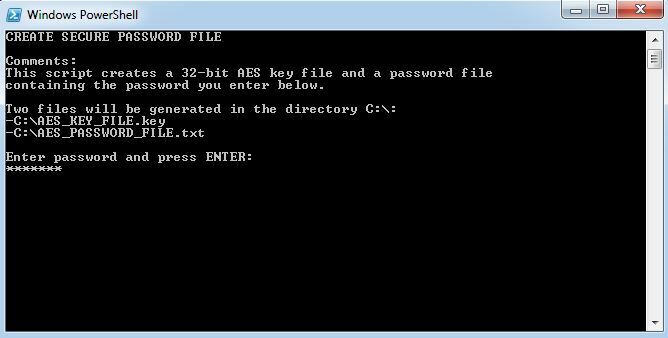 When you use this method you will generate two files: a 256-bit AES key file and a password file. These files can than be used in your PowerShell scripts on local and remote computers. The idea is that you create a 256-bit AES key file and one file which contains your password. The password in the password file is encrypted by the 256-bit AES key file. Confused? Don't be. All will be explained in a moment. Here is an example of the key file and the password file. You can open these files in an editor such as Notepad, but you will only see gibberish. Once you have created the two files you can keep them on the local computer or copy them to a network share. Copying these files on a network drive means that you can use the same files on multiple computers. Please be aware that anyone with access to the key file can retrieve the password stored in the password file (the file AES_PASSWORD_FILE.txt in our example). Therefore, make sure that you configure NTFS permissions to prevent unauthorized access to this share! So how do you use these files once you created them? The following code snippet show you how the PSCredential object retrieves the content from the password file (C:\AES_PASSWORD_FILE.txt), using the AES key in the key file (C:\AES_KEY_FILE.key). This is all great, but how to create these files? First, save the PowerShell script below in a PS1 file (e.g. C:\CreateSecurePassword.ps1). You can change the directory path and files names in lines 17 to 19. By default the default directory is C:\. The file names are AES_KEY_FILE.key and AES_PASSWORD_FILE.txt. Enter your password and click ENTER. The files will now be created. In case of an error, the error description is displayed in the PowerShell window. $KeyFile = Join-Path $Directory "AES_KEY_FILE.key"
$PasswordFile = Join-Path $Directory "AES_PASSWORD_FILE.txt"
Write-Host "CREATE SECURE PASSWORD FILE"
Write-Host "This script creates a 256-bit AES key file and a password file"
Write-Host "containing the password you enter below." Write-Host "Two files will be generated in the directory $($Directory):"
Write-Host "Enter password and press ENTER:"
Write-Host "The key file $KeyFile was created successfully"
write-Host "An error occurred trying to create the key file $KeyFile (error: $($Error)"
Write-Host "The key file $PasswordFile was created successfully"
write-Host "An error occurred trying to create the password file $PasswordFile (error: $($Error)"
write-Host "End of script (press any key to quit)"
This method works fine when you want to parse a secure password to a PSCredential object. However, in some rare cases you may actually need to parse a plain-text password. Not to worry, you can decrypt a secure password to a plain-text password in memory. The key/password file method described in this section ensures that you do not need to enter any plain-text password directly in your script. After creating both files you copy them to a directory on the local server or on a network share. After that, you only need four additional lines of PowerShell code to read the secure password from the password file and to decrypt it to a normal readable plaint-text string. Biggest advantage: can be used in multiple scripts on remote computers. Biggest drawback: not 100% secure. The AES key file can be used to decrypt the password and therefore requires additional (NTFS) protection from unauthorized access. 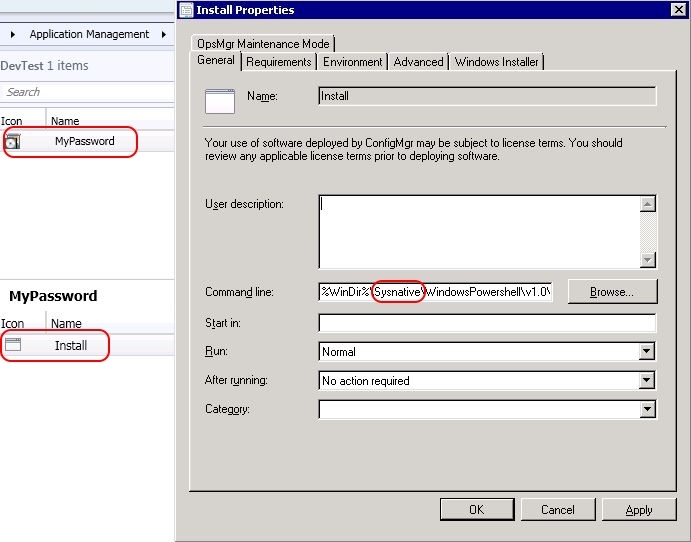 For those of you who use PowerShell scripts in SCCM applications and packages, a good way of dealing with passwords is to use a collection variable. 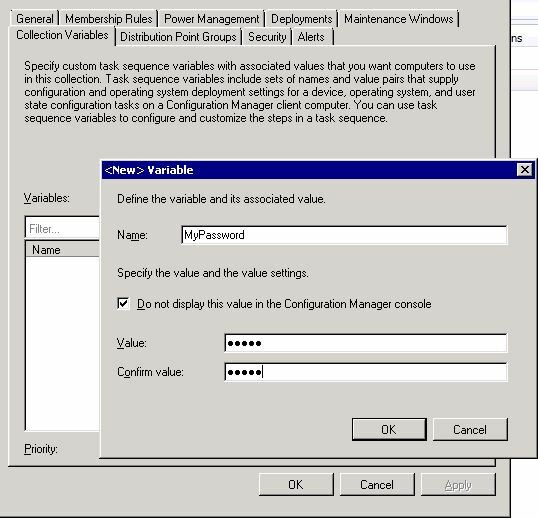 When creating a collection variable, make sure that the tick box Do not display this value in the Configuration Manager console is marked. This makes the variable "secure". Secure in this case means that the variable is stored in the SCCM SQL database. The variable sysnative will redirect the 32-bit process to the 64-bit subsystem and, in our example, will start the 64-bit PowerShell executable (instead of the 32-bit one). The next step in the script is to retrieve all task sequence and collection variables. When the variable name is MyPassword, it's value is read and stored in the PowerShell variable $AccountPassword. After that, the PSCredential object is created using the user name stored in the variable $Account and the password stored in the collection variable MyPassword. One last tip; make sure to watch out when writing the variables to a log file. You do not want to write your password to your log file in plaintext! Biggest advantage: relatively secure (but definitely not 100%!). Biggest drawbacks: the SCCM collection variable cannot be shared among other collections. The password variable needs to be set on each collection that requires it. Also, retrieving the password using the Microsoft.SMS.TSEnvironment COM object is relatively complex. Finally, I want to present to you another approach which I found very interesting, namely using the local Windows Credentials Manager to store your passwords. Please be aware that this script has not been tested on newer operating systems such as Windows 10 and Windows Server 2016. Also, this script only works on the local server. The Win32 API CredMan cannot connect to remote computers. Biggest drawback: can only be used locally and the automation is complex. All-in-all, none of the methods presented in this article are perfect. There simply is no 100% perfect solution. Each method has some advantages and some drawbacks, but these methods are all that exist (at least to my knowledge). You need to choose the one which is best suited for your current situation. I hope this article gave you some insights in the world of passwords and PowerShell. Happy scripting! This entry was posted in Other, SCCM and tagged PowerShell, Scripting by Dennis Span. Bookmark the permalink. It appears you accidentally flipped the file names (stating that the password file is entitled “key” and that the key file is entitled “password”). Thanks a lot Steve! And yes, you are correct; I did flip the file names. I just corrected it. Thanks! Thank you for the excellent breakdown of options for creating secure credentials for use in PS scripts. I am new to PS and trying to understand the best way to apply these stored credentials to an exe file in a PS script that is using switches to supply username and password to the exe. There seems to be a lot of posts out there about using stored credentials with PS cmdlts but little to nothing about exe. I am trying to convert a batch file with clear text credentials to a more secure powershell script. Thank you for your comments. And yes, I understand your point. I made a note of your remarks in the main text. Thanks once again for your input.